MASON, Ohio - Both the CMS men's and women's tennis teams just completed record breaking seasons. The Stags won the NCAA Division III national title for the first time since 1981, while the Athenas finished in fourth place which tied for the team's best finish in program history. Read recaps below of the men's title match and the women's match from May 20 at the NCAA Division III Tennis Championships. CMS 5, Middlebury 0 (Men's National Championship Match) The wait is over. After 34 years and back-to-back losses in the national title match in 2013 and 2014, the No. 1 ranked Claremont-Mudd-Scripps men's tennis team is bringing the national championship trophy back to Claremont. 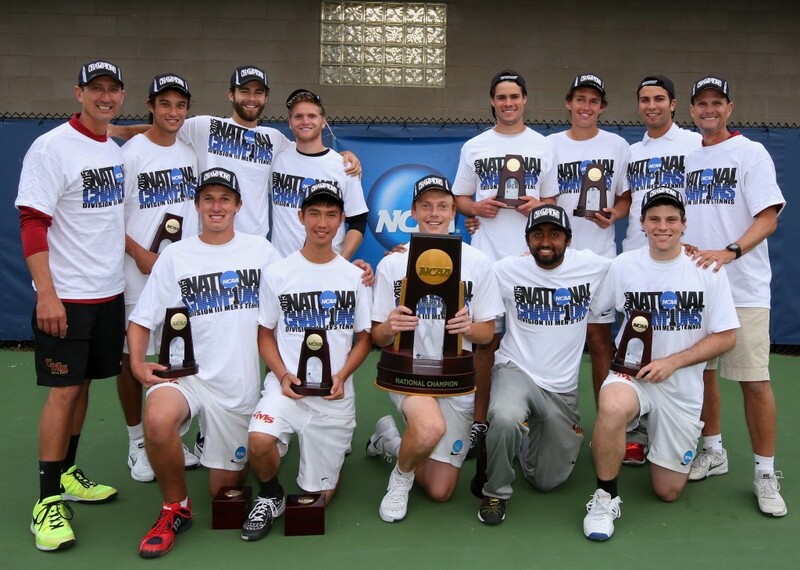 CMS soundly defeated Middlebury 5-0 in the national title match of the 2015 NCAA Division III Men's Tennis Championships on May 20 at the Lindner Family Tennis Center. For the Stags, it is the second national title in program history, the other, a tie, coming in 1981. CMS Athletics has now won three team national championships as an athletic program, two for men's tennis (1981, 2015) and one for men's swimming (NAIA – 1967). "It's been a long road," said senior Warren Wood (CMC) after the match. "Two years in the finals and not quite getting there [winning the title], especially at home last year, that really pushed us this year." In Wednesday's match, that motivation and CMS' national title match experience from the last two seasons showed through. Nowhere was that more evident than in doubles. After a dominant 8-1 No. 2 doubles win by sophomore Daniel Morkovine (CMC) and junior Skyler Butts (CMC), the Stags had to show its mettle in No. 1 and No. 3 doubles. Seniors Joe Dorn (CMC) and Wood came back from a 3-1 deficit and ran off seven-straight games to win 8-3 over Palmer Campbell and Peter Heidrich at No. 1 doubles. That win by Wood and Dorn avenged their 9-7 early-season loss to Middlebury's top doubles team in Claremont. Fellow senior Nikolas Marino (CMC) and sophomore Glenn Hull (CMC) followed with a comeback of their own in No. 3 doubles, 9-7. The CMS duo trailed 7-3 to William de Quant and Chris Frost, but came back and took the lead at 8-7 with a win in a game that saw at least five deuces. In the next game with Middlebury serving, Marino had the match-clinching point. That all happened after Middlebury had the opportunity to win the third doubles match on several occasions, serving to win the match at 7-4 and 7-6. With all of the momentum heading into singles, the Stags wrapped up the title with wins at No. 1 and No. 6 singles. Wood won 6-1, 6-4 over Ari Smolyar at No. 1 singles and trailed in the second set before coming back to get the win which moved CMS ahead 4-0 and one point away from the title. Just minutes after Wood won his match, Hull clinched it with a cross-court backhand that Middlebury's Kyle Schlanger was unable to return. Hull won his match 6-2, 6-2 over Schlanger. The Stags also led at No. 2 (Butts), No. 4 (Dorn) and No. 5 (Morkovine) singles when the match ended. This was the 11th meeting between CMS and Middlebury since 2005, with CMS having won nine of the matches. It was the first match-up between the two programs in the title match. Last season, CMS defeated Middlebury 5-2 in the national semifinals. CMS' historic season closes with a 32-2 record, undefeated against NCAA Division III opponents. While the team season is over, Butts, Wood and Dorn are all participating in the singles and doubles NCAA Division III Championships May 21-23, also in Mason, Ohio. Butts and Wood qualified in singles, while Wood and Dorn qualified as a doubles team. Draws and brackets for the singles and doubles championships can be found here. Amherst 5, CMS 1 (Women's NCAA D-III Third Place Match) For the second time in three seasons (2013 and 2015), the Claremont-Mudd-Scripps women’s tennis team has finished in fourth place at the NCAA Division III Women’s Tennis Championships. CMS lost 5-1 to Amherst in the third place match on May 20 at the Lindner Family Tennis Center, but still secured a tie for the best finish in program history. Just like in 2013, CMS lost to a tough Amherst squad in the third place match. CMS’ team season comes to a close with a 25-3 record, the second-highest win total in program history, second only to last season’s 31 wins. Doubles were extremely close with both teams having the opportunity to lead after doubles. Amherst had the opportunity to lead 3-0 and CMS had its own chances to take a 2-1 lead. In the end, Amherst ended up leading 2-1 after doubles. Safy Aly and Sarah Monteagudo of Amherst won No. 3 doubles 8-3 over freshmen Lindsay Brown (CMC) and Lauren Livingston (CMC) for the first doubles point. Then in a tiebreaker, junior Caroline Ward (CMC) and sophomore Katie Kuosman (CMC) defeated Vickie Ip and Sue Ghosh in No. 1 doubles, 9-8 (7-1). After trailing at times at No. 3 doubles, senior Sarah Kukino (CMC) and freshman Kyla Scott (HMC) nearly gave CMS a 2-1 lead heading into singles. However, Jackie Calla and Maddy Sung hung on for a 9-7 win. In singles, Amherst took No. 4, 2 and 3 singles in straight sets for the overall win. On the three courts that did not finish, CMS led in the fifth and sixth positions. Freshman Bria Smith (CMC) led 6-3, 5-2 for CMS in her No. 6 singles match, but came up just minutes short from closing out the win when Amherst ended that match with a win at No. 3 singles. While the team season is over, Ward and Kuosman are both participating in the singles and doubles NCAA Division III Championships May 21-23, also in Mason, Ohio. Draws and brackets for the singles and doubles championships can be found here.